KINGSTON, Jamaica, CMC – Former West Indies team manager Ricky Skerritt and Dr Kishore Shallow are the new president and vice-president of Cricket West Indies (CWI). Both were elected during the Annual General Meeting (AGM) at the Jamaica Pegasus Hotel in Kingston yesterday, after defeating incumbent Jamaican Whycliffe ‘Dave’ Cameron and his vice-president and running mate, Emmanuel Nanthan 8-4. The victory will see Skerritt, 62, a former Minister of Sports and Tourism in St Kitts and Nevis and Shallow, the current president of the St Vincent & The Grenadines Cricket Association, taking up office for the next two years. They denied Cameron and Nathan a four-consecutive term. 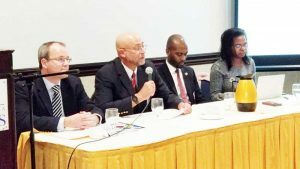 Skerritt expressed surprise at the margin of victory, as the election was expected to be a close battle. Prior to the elections, Skerritt was assured of the backing of Trinidad and Tobago and the Leeward Islands and possibly Jamaica, while Guyana, Barbados and the Windward Islands had thrown their support behind Cameron. “I am not even sure where the eight votes came from, but I can tell you that everybody has the right to privacy with their votes. I am indeed grateful that we were able to get eight votes and that gave us more than a one-vote margin,” Skerritt said. “But in this business, we have learnt that if the message resonates with individuals, even those individuals who may have what you call a mandate, and if they feel strongly enough about an issue they will actually go against the mandate. “That was the basis on which we started our campaign, knowing that we could build our voting base by being consistent with good ideas, [and] reaching out with a positive campaign to bear on the voters and I think that happened. I am humbled and deeply honoured to be elected as president and we pledge to work for improvement on and off the field for West Indies cricket,” he added. Cameron, who was first elected in 2013, was pleased about his six-year run in office. He, however, expressed disappointment with the outcome, having confidently stated that he was in no danger of losing the CWI top job. “I am very surprised, but I just like to say thanks to the region for the opportunity to serve West Indies cricket, it was a tremendous run. When we came into office we found West Indies cricket in a state and I think we now leave it in a better state and we are very proud of those achievements,” Cameron shared. He continued: “I trusted the process that we are men of integrity and I banked on that, that we are a group on integrity and we stand for something, so that’s where I am very disappointed that men gave me their word and then went a different way.